Protect Yourself From Abuse, Neglect and Exploitation! This document was completed by the Center of Excellence on Elder Abuse and Neglect for the National Center on Elder Abuse and is supported in part by a grant (No. 90AB0002/01) from the Administration on Aging, U.S. Department of Health and Human Services (DHHS). Have your income (e.g. retirement, Social Security, SSI, disability income) directly deposited into your checking account. Contact your bank or go to www.godirect.org for help. If managing your daily finances becomes difficult, consider utilizing a daily money manager. Only allow someone you trust to manage your finances. Visit www.aadmm.com or www.aarpmmp.org for further information on professional money management services. durable power of attorney for healthcare and/or asset management. Name a person you trust to make healthcare and asset management decisions for you when you are incapable. Designating co-powers of attorney can ensure that no one agent can act unilaterally. If you have to go to a long term care facility, learn about your options! Visit www.medicare.gov/quality-care-finder/ for more info on long term care facility quality. Get on the National Do Not Call Registry to reduce telemarketing calls. Visit www.donotcall.gov or call 888-382-1222 to register your phone number. If you are offered a “prize”, “loan”, “investment”, etc. that sounds too good to be true, it probably is too good to be true. Consult with someone you trust before making a large purchase or investment. Don’t be pressured or intimidated into immediate decisions. Don’t sign any documents that you don’t completely understand without first consulting an attorney or family member you trust. Do not provide personal information (e.g. social security number, credit card) over the phone unless you placed the call and know with whom you are speaking. Tear up or shred credit card receipts, bank statements, and financial records before disposing of them in the trash. If you hire someone for personal assistance services, in home care services, etc. ensure that they have been properly screened with criminal background checks completed. Create a buddy system with other elders, call each other daily for reassurance and friendship and visit each other if possible. Making a report in instances of abuse or neglect is the right thing to do, and it’s easy. Don’t be afraid! Elders have a right to be safe! In cases of immediate danger, call 911. Adult Protective Services (APS) is there to help. The APS mission is to ensure the safety and well-being of elders and dependent adults. To learn more about APS visit: www.napsa-now.org/get-help. Call Eldercare Locator at 1-800-677-1116 or visit the website at www.eldercare.gov/eldercare.NET/Public/index.aspx for your local reporting phone numbers. You may also visit the National Center on Elder Abuse website at: http://www.ncea.aoa.gov/Stop_Abuse/Get_Help/State/index.aspx to get state by state reporting information. 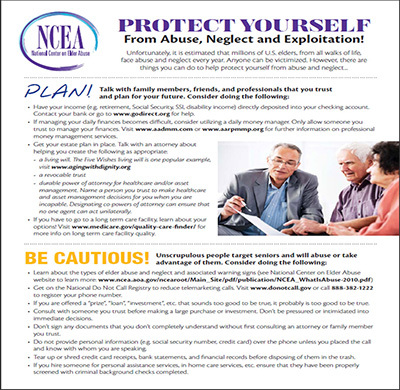 Eldercare Locator and National Center on Elder Abuse created a "Protect Your Pocketbook: Tips to Avoid Financial Exploitation" brochure for campaign to prevent financial abuse of older adults. Download the "Protect Your Pocketbook" PDF or order printed copies from Eldercare Locator.